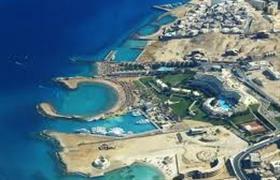 Egypt - a great tourist destination with a year-round beach season, clean sea and available house prices. This mysterious ancient state bordering the Red Sea and the Mediterranean. Properties in Egypt - lovely houses in a region, where the nature is fabulous and the sun is always shining. Since 2004, foreigners are allowed to buy lodging in the country, which gives wide investment opportunities, due to the fact that the country has a low cost of living and public services, which makes it not only interesting for tourism, but also for a permanent residence. The activity of foreign tourists all year round allows good rental earnings, if you do not live permanently in your property. The country has a high rate of growth in real estate prices that reaches 40% for a year, which is rare nowadays. And the rents are so high that they can make 15% per annum! Property from the builder can be obtained by installments for up to three years. Increased interest in the Egyptian real estate by investors from many countries guarantees a profitable resale. Foreign investors, of course, are most attracted to the Egyptian real estate in the resort regions, where you can make a great rental. Others prefer to buy "country houses" abroad for a family vacation. But you can buy a flat in apartment-hotels, enjoying closed residential complexes. A foreign investor, as an individual, cannot buy real estate in the country, but a legal person - could. After you obtain a written permission of the Prime Minister of Egypt, you will be able to dispose of the registered property right on the next day. All minor restrictions on residential real estate do not apply to commercial, which is available for foreign buyers in any quantity – residential property, for example, is limited to an area of 4000 square meters. Wealthy foreign investors are increasingly engaged in the Egyptian housing, so this type of investment is very promising and profitable for you and your family. This is a secure future and a great opportunity to rest and work at the same time, so you should definitely take a look at this country if you want to dive into the world of exotic and eternal summer.